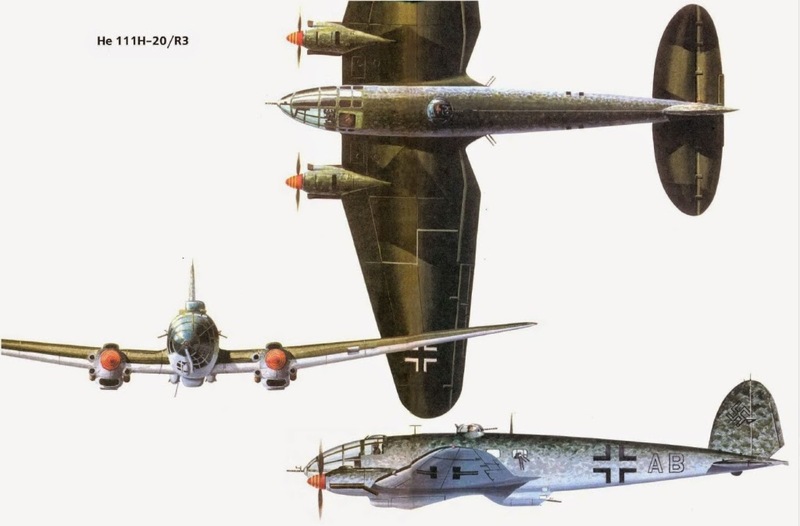 The H variant of the He 111 series was more widely produced and saw more action during World War II than any other Heinkel variant. Owing to the uncertainty surrounding the delivery and availability of the DB 601 engines, Heinkel began tests with the 820 kW (1,100 hp) Junkers Jumo 211 powerplants. The somewhat larger size and greater weight of the Jumo 211 engines were unimportant considerations for a twin engine design, and the Jumo was used on almost all early-war bomber designs. When the Jumo was fitted to the P model it became the He 111 H.
The last major production variant was the H-20, which entered into production in early 1944. It was powered by two 1,305 kW (1,750 hp) Junkers Jumo 213E-1 engines, turning three-blade, Junkers VS 11 wooden variable-pitch propellers. Heinkel and its licenses built 550 H-20s through the summer of 1944, while 586 H-6s were upgraded to H-20 standard. In contrast to the H-11 and H-16 the H-20, equipped with two Jumo 211F-2s, was given more powerful armament and radio communications. The defensive armament consisted of one MG 131 in an A-Stand gun pod for the forward mounted machine gun position. One rotatable DL 131/1C (or E) gun mount in the B-stand was standard and later MG 131 machine guns were added. Navigational direction finding gear was also installed. The Peil G6 was added to locate targets and the FuBI 2H blind landing equipment was built in to help with night operations. The radio was a standard FuG 10, TZG 10 and FuG 16Z for naviagational direction to the target. The H-20 also was equipped with barrage balloon cable-cutters. The bomb load of the H-20 could be mounted on external ETC 1000 racks, or four ESAC 250 racks. The sub variant H-20/R4 could carry 20 50 kg (110 lb) bombs as external loads.